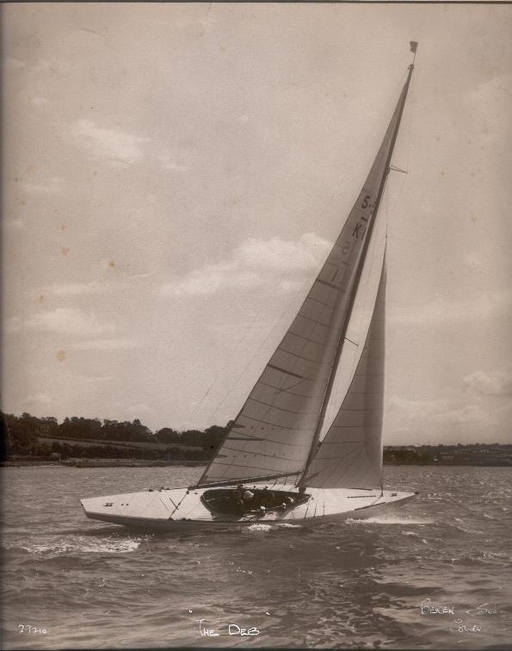 ‘The Deb’ was bought by Alex Duncan who found it lying in a bad way in a mud berth at Penarth, North Wales – he thought it had been advertised somewhere. Alex and Robin Taylor towed it (with difficulty) behind a Volvo 244 to Rothesay, Isle of Bute, Scotland, where it was restored, painted dark green and sailed for 2-3 seasons and was chartered out occasionally. In an easterly gale in c. 1978 it broke from its moorings and was washed up on the beach and totally destroyed. So, a real shame it has been lost, but at least we now know its fate. We moved up to London when I was 11yo about 1968 and it was about this time that my father sailed The Deb from Weymouth to her new home / owners at The Isle of White. About 1965 my father brought an old 5.5 that was in a bit of a state. He did a beaut job of restoring it. She was built by Camper&Nicholson. We understood that there was a prototype build first but never raced. I think she was sold in about 1968 to someone on the Isle of White. I wonder if any one knows what became of her...?